Yes. Yes it's true. I loved it. 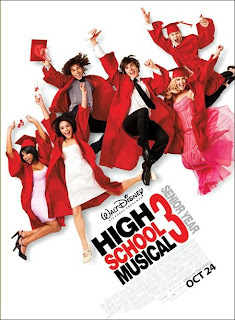 I loved the movie High School Musical 3. Yes, that's the love song you're hearing on my playlist. I get choked up everytime I hear Troy start to sing his part. Don't laugh. Don't think less of me. I am a hopeless romantic. And I love sappy love songs. It began with Karate Kid II's Glory of Love when I was, like, 7. And let's not forget Robin Hood's Everything I Do I Do It For You the year I left my own high school - and high school boyfriend - behind! Aaah. Good times. Good times. Oops. Back to the present here. So, let me just tell you. Yes. You know the story line already. The apple of 3 didn't fall far from the tree of 1-2. However, I loved the way the musical was woven into the 'present.' I thought the dancing was often incredible (how does Gabriella hold that pose while mid-flight, backwards on a stone wall with high heels on?!?!). And, I'm sorry, but I just adore the main couple - and all the little nuances between the other 6 stars, as well. I read an online review Friday night that said the moms would be swept back to the days of Dirty Dancin' (only without the 'dirty dancing' - another reason to love it: it's squeaky clean! Yay Disney!) when we all swooned as Patrick Swazey insisted, "Nobody puts Baby in a corner." Oh yeah. I felt like I was back in high school. I thought the movie was great. I bought the soundtrack. I nearly wept when the kids went dancing crazy off from chairs like Troy had in the movie and My Man took away my CD (I mean their CD) as punishment to deter broken limbs...We earned it back, though. I mean they did. And we listened to it in it's entirety, and I loved it even more. Yes. I am 35 years old, and I love High School Musical.